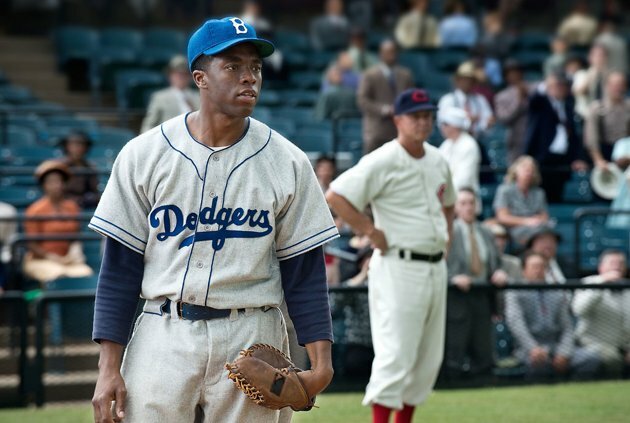 RYAN: It’s the new baseball movie about Jackie Robinson, the first African American athlete to make it in major league baseball. RYAN: It’s so worth it. 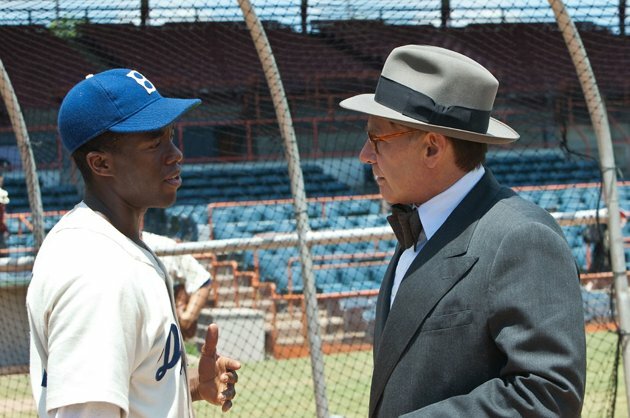 We’re not baseball fans but you simply don’t have to be to enjoy this movie. It’s such a well crafted film and I was totally edge of my seat during the baseball scenes. 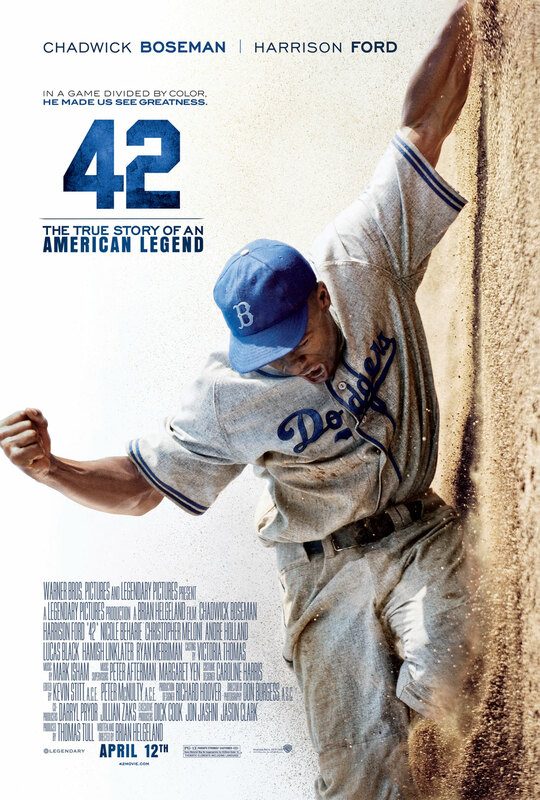 If real baseball was like this movie, I’d be the biggest baseball fan in the world! CAROLINE: Whoa ok. How’s the cast? RYAN: Terrific. It’s basically a TV star, Chadwick Boseman, as Robinson and he’s great. Then there’s Harrison Ford as the owner of the team, doing his best Clint Eastwood impression. CAROLINE: [laughs’ Really? Like a low whisper? RYAN: He’s gruff-talking in this movie. He sounds like a cross between Clint Eastwood and Christian Bale as Batman. CAROLINE: [laughs’ I know exactly what you mean! Scary. RYAN: He’s great though and plays it with bravura. And he has a moment that’s so good, if this movie were coming out later in the year, it would have been an Oscar contender. It’s random timing to come out now. CAROLINE: Well it is around the start of the baseball season. RYAN: Too true. This is a great American period film – the music, costumes, hair, cars… all cool but the racism of the time was scary! It’s truly disturbing and it’s really not that long ago. CAROLINE: Isn’t T.R. Knight also randomly in this? RYAN: Yes! He hasn’t done much since TV’s Grey’s Anatomy but he is here and he’s great. CAROLINE: It looks like a decent movie though I haven’t been that inspired to see it based on the commercials. RYAN: It’s really a technically good movie and also a wonderful entertainment. It’s very complete and just rousing, again. I was very moved by this film in several ways. Robinson was a helluva talent but an underdog, a pioneer and a hero to many. CAROLINE: Wow, you should be writing the tagline for the movie! RYAN: What I’m trying to say is, even if you’re thinking this movie isn’t for you, it is. It’s for everyone and it’s great.